If you’re out of honey, or you don’t want to buy any because of the price, use this honey substitute in its place. It relies on two basic ingredients that can be found in almost any kitchen, and it comes together in minutes. Dump the granulated sugar and water into a pot, and heat over medium heat, stirring constantly, until the sugar dissolves into the water. Then, replace the honey called for in the recipe with an equal amount of honey substitute. This mixture is a good approximation for the thickness of honey, so you shouldn't notice a significant change to your recipe. This recipe makes 1/4 cup (or 4 tablespoons) of honey substitute. Just stick to a 5:1 ratio, and you can make as much as you need. If you’re trying to watch your sugar intake, you can use a sugar replacement in place of the granulated sugar. Just be sure to use one that replaces the sugar measure for measure, so the recipe turns out the same. If you’re running low on granulated sugar, you can also use an equal amount of corn syrup in place of the honey. Light corn syrup would be the best flavor match, but dark corn syrup will work, too. Other options to try: maple syrup or molasses (not black strap). These substitutes can replace honey measure for measure. They may change the flavor of your recipe slightly, but that could turn out to be a good thing. Looking for a Sub Because You Think Your Honey's Gone Bad? Honey is actually the only food that scientists have found never goes bad. If your honey looks cloudy or thicker than it should, that’s just a sign that the sugars have crystallized. 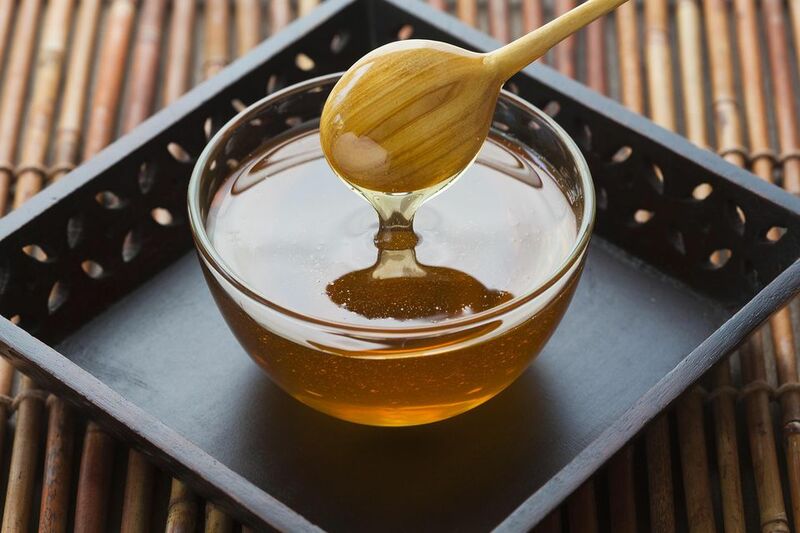 To return your honey to its original state, just remove the lid, place the jar in a pot of water, and heat it over low heat until the sugar dissolves back into the honey. If your honey is in a plastic container, be sure to transfer it to a heat-safe container before you heat it on the stove. It's important to note that while honey doesn't go bad, it can ferment if it contains too much water. If you notice lots of bubbles on the surface, a bulging lid or a change in taste, there's a good chance your honey has fermented. It's perfectly safe to continue eating it, if you like the taste and don't mind the alcohol content, but it isn't safe to continue storing it in a glass jar. As carbon dioxide builds up, the pressure will eventually cause the jar to explode. So, if you decide to keep your honey, be sure to transfer it to a plastic container, so you don't have to worry about your safety, or find yourself cleaning up a big, sticky mess off every item and surface in your pantry. You can usually count on a honey substitute to work well in baked good recipes. If the honey you’re replacing is in a sauce, a glaze or marinade for meat or vegetables, use maple syrup in its place. It’ll act in much the same way, even if it changes the flavor of the dish a bit. For recipes that include the word “honey” in their name, you may want to think twice about making a substitution. The honey is probably a key part of the dish’s flavor. Using a substitute in a honey mustard dressing = bad idea.